I’m not really sure what this is. The lady at the used furniture store where I bought it had labeled it as a “gardening table.” When my husband called me and told me that there was something with cracked ice laminate at the used furniture store, I was all over it. It’s in remarkable condition, with nary a scratch or dent ot be found. The top of the table lifts off, which is perhaps why the seller believed it was a gardening table. In any case, it fits in with my kitchen decor, and it is now being used to hold my laptop, which I use to listen to music while I work. The glasses on the table were part of the retro Christmas gifts from my mom. I had them on the table, but quickly moved them because they made a “tinkling” sound every time the table was jiggled. They now live on the bottom tier of this table, where they don’t get jiggled. It’s never too early to think Christmas! this is a 1950’s tea cart. The tray is removeable for serving. The top is cracked ice formica, common serving cart in the 1950’s. I have one in green with two drop leaves, one on each side instead of a removable tray. I have also sold a yellow cart. They usually matched the chrome dinette sets popular during this time. Thanks, Jessie, for identifying this. I can see how it would make a perfect serving table. I wonder if I’d be lucky enough to run across a red one to match my table? Now that I know what it is, it’ll be easier to search for one. 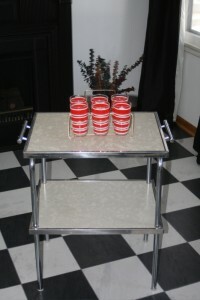 I just inherited a similar cart only it is red with the cracked ice look and has two drop leaves instead of a removal tray. The legs are chrome and has wheels. There is chrome around the outside of the tabletop and on the drop leaves. I want to sell it but don’t know what to call it or how much to ask?????? Can you help? Or maybe you would be interested in this one. It is so cute and it sounds like something you are looking for. I live in Seattle, Washington.